Come join the Fun Company! 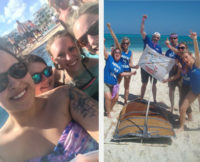 We focus on providing an exciting and enjoyable work environment through employee incentives, internal celebrations, offsite events, and training trips to locations like Aruba, Jamaica, and Punta Cana! Employees also enjoy a comprehensive benefits package and a generous paid time-off policy. Our company culture is based on teamwork, with everyone working hard together to reach our goals. Our CEO and Executive Team have an open door policy and spend time with employees regularly to learn and share ideas. When we work together, we succeed!